I’ve just today completed project number 13 for the BOOK!!!! I’m really thrilled with how they’re all coming out…I hope that you will be too when I finally get to share them with you. It’s been like expecting a baby and keeping all the milestones and progress a secret, lol. Complete 7 more new projects for the book. Type all the patterns into the computer…I should be doing this as I go, I suppose, but I tend to take my knitting everywhere with me, and my little design notebooks go along for the ride, too. Inside their pages are stashed all my notes for new projects as I knit, as well as little drawings that will be included as pics/sketches to help with the understanding of the process of re-creating them. I have been really hesitant about changing the way I record the patterns, because the notebooks have become like little creative diaries for me over the last almost 6 years. I can look over past notes, doodles and designs and remember everything that was happening in my life at the time. They’ve in a way, become good friends…it’s never easy to turn your back on a friend, right? 🙂 …so back to my goal: begin typing all the patterns into the computer, lol. I think that’s quite enough for 30 days, don’t you? September will have it’s own goals that will require re-knitting these projects into other sizes/colors, photography, step-outs, editing…etc. ps: Just out of curiosity, I went back and counted all of my original patterns and projects that have been scribbled down into the pages of my little design diaries and counted a total of…72!!! No kidding…I really had no idea there were so many, lol! 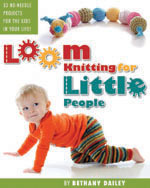 This entry was posted in Book Progress, Loom Knitting, Looming Patterns, New Projects. Bookmark the permalink. Sounds like you are doing it the way it’s suppose to be done, Bethany! If I every do another one, I’m going to plan ahead instead of going the assigned “3 week wonder” route. I can’t wait to see your finished book. Looking forward to the new baby! When you complete your book (which by the way, I am eagerly waiting to add to my collection) will it be an e-book or paper bound? I love them both, but I wish paper bound books pattern books were spiral bound so they lay flat when doing a pattern.